How many times have you heard someone say that they have to go and find themselves? That they have to search for that knowledge of self, for that sense of purpose? I have heard that saying a lot used by people, some who were truly lost and others who just truly needed an excuse for why they weren’t doing anything. I actually hear that phrase from writers a lot because they are always so caught up in making up a life for their characters that they sometimes forget to live the life that they already have. I heard this quote the other day “The self is not something one finds, it is something one creates”, and it just stuck with me. People who are always trying to find themselves, trying to figure out what it is they want in life, they don’t realize that in their journey to find themselves, all of the decisions they are making, the mistakes that they are enduring, is already creating who they are meant to be. Some decisions made for us, when we are too young to know any better, they are in a sense out of our hands, but how we deal with the fallout, the end result, that is in ours. When we choose something, be it right or wrong, little by little it shapes who we are, and eventually who we become. None of us start off knowing what kind of person we are going to be at the end of our journey. Growing up I had to learn and teach myself how to love me. I guess you could say that who I am now, I created that person and had I made a choice to continue not loving myself and to continue to think that because my mother didn’t love me, or at least didn’t express that love to me, that I was somehow unworthy of that love from others, especially from myself, had I continued down that path I suppose I would have created a whole other type of person than I am now. So before any of you get it in your head that they need to find themselves and discover who they really are, keep in mind that the decisions you have already been making are already creating the person you were meant to be. Stop searching for who it is that you think you should be, or should have been and embrace the person that you have already created thus far. Our journey is not done yet but who we are meant to be is already inside of us, we don’t have to find it, we just have to create it. Stop waiting for some moment of revelation to come, some big moment where suddenly everything you are is so clear to you. 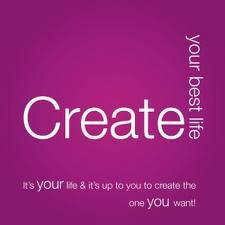 Create the life you want, don’t sit and wait for it to be created for you to find.